Here is my entry for the latest Runway Inspired Challenge (ric#70). I struggled with this challenge because I saw the drop dead gorgeous cards that were posted by others. Usually, I try to NOT look at what other people have created. But, over the last week I saw several on blogs I read daily, Amy Rohl – Ink About Me , Kittie Caracciolo for Ellen Hutson’s The Classroom . Sometimes, I find it difficult to see past what a real artist sees. Intimidated, I am! Anyway, down to the last minute for me. I wanted it to be easy to mail, so a one layer card. All images are embossed. 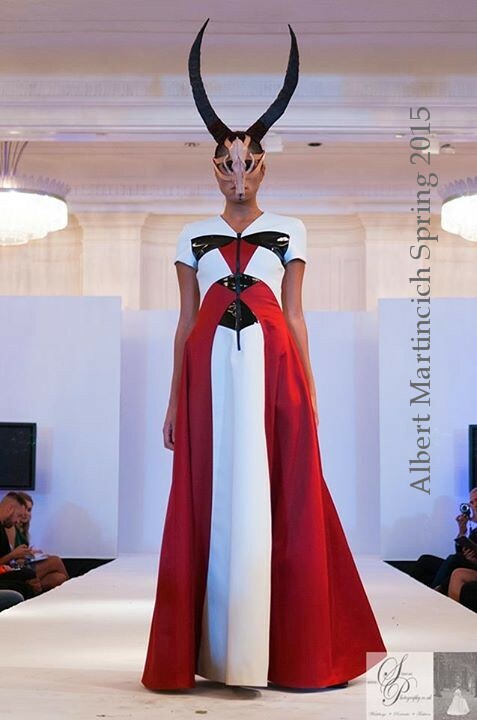 My inspirations were the vertical red, and the shine from the black elements on the dress. I stamped my envelope first, and, OH, my design was born. Supplies: Stamps – Papertrey Ink, Reverse Confetti, paper – Papertrey Ink White, inks – VersaFine Onyx Black, Satin Red, embossing powder – Filigree Fine Art Powder clear, Hero Arts Liquid Platinum. Categories: card, encouragement | Tags: card, Hero Arts, Papertrey Ink, Reverse Confetti, Runway Inspired Challenge | Permalink. 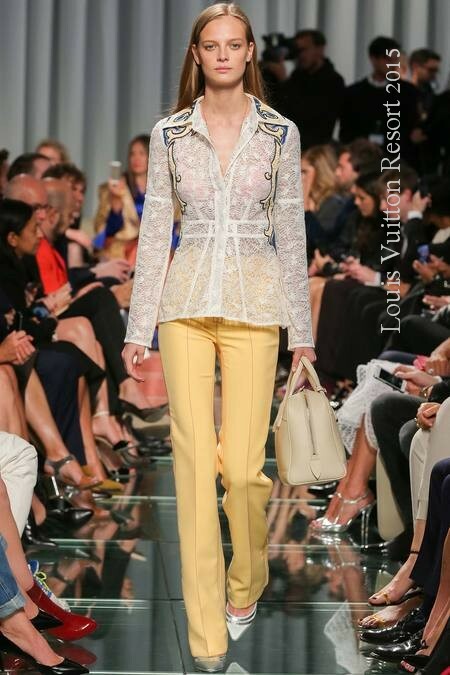 Here is my take on the latest Runway Inspired Challenge ric#69 . I struggled a bit with this, sometimes my brain wants to be too literal and I don’t have the supplies my brain wants to use. So, I chose to use the colors, the flower to the right of the model, and a vertical black accent. Supplies: Stamps – Papertrey Ink, Stampin’ Up!, paper – Papertrey Ink White, Stampin’ Up! 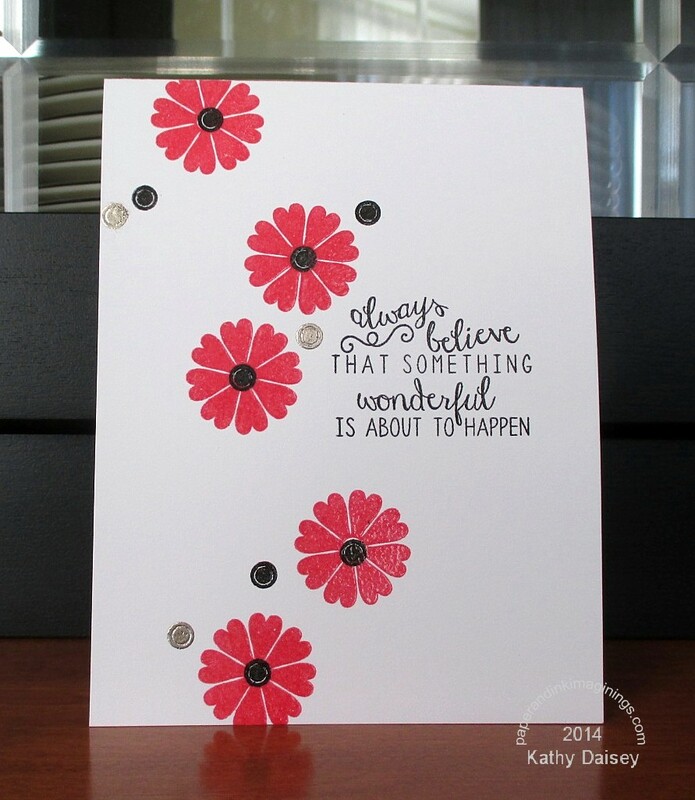 Basic Black, inks – Stampin’ Up! Creamy Caramel (retired), Daffodil Delight, VersaFine Onyx Black, Vintage Sepia (under gold embossing), embossing powders – Filigree Fine Art Powder clear, Stampin’ Up! Gold Detail Powder. 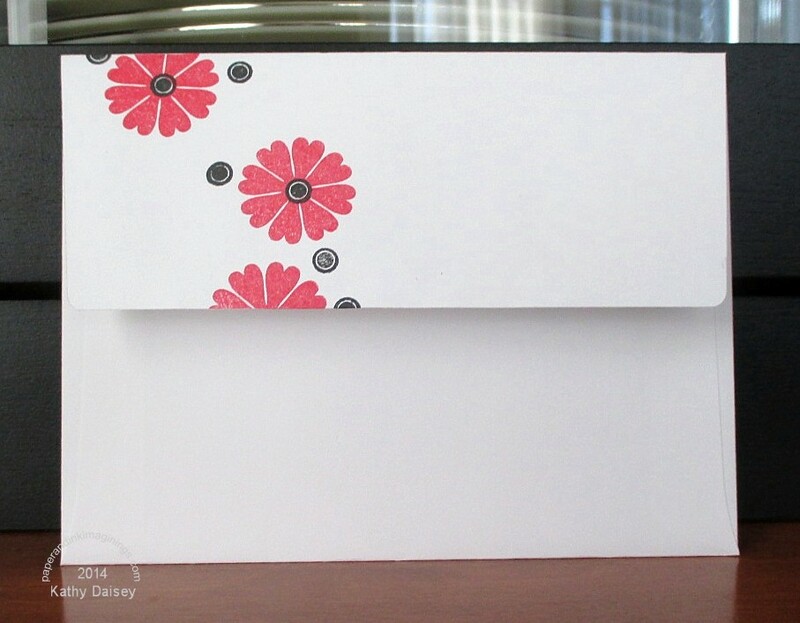 Categories: card | Tags: card, Papertrey Ink, Runway Inspired Challenge, Stampin' Up! | Permalink. 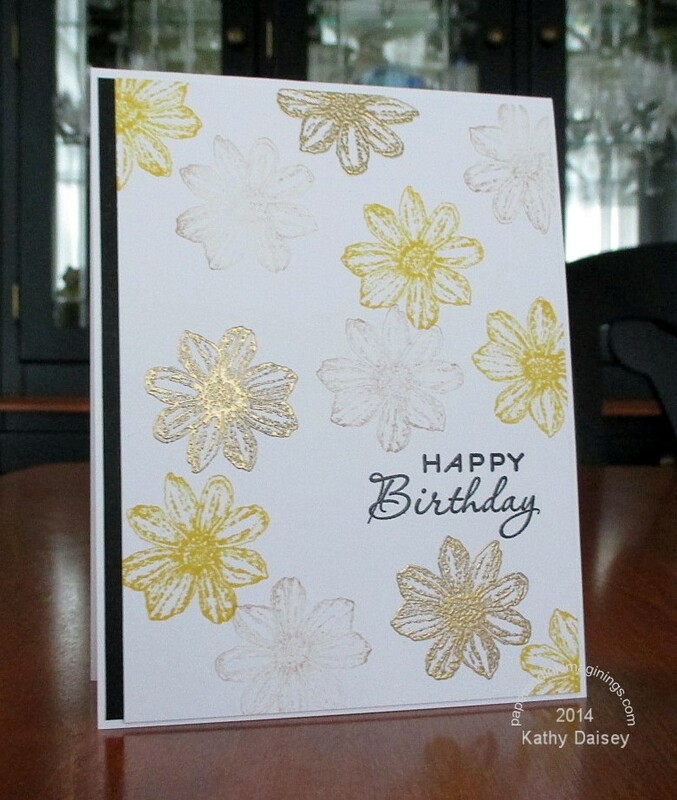 I stamped two different diamond background stamps on cream cardstock, embossed the floral outlines with gold embossing powder, and die cut each flower. The greeting is also done in gold. The most difficult part was trying to keep the diamonds parallel to each other when adhering the flowers. Supplies: Stamps – Stampin’ Up!, paper – Papertrey Ink Vintage Cream, inks – Stampin’ Up! Cameo Coral (retired), Perfect Plum, VersaFine Onyx Black, dies – Stampin’ Up!, embossing powder – Stampin’ Up! Gold Embossing Powder, metallic cord – Stampin’ Up! 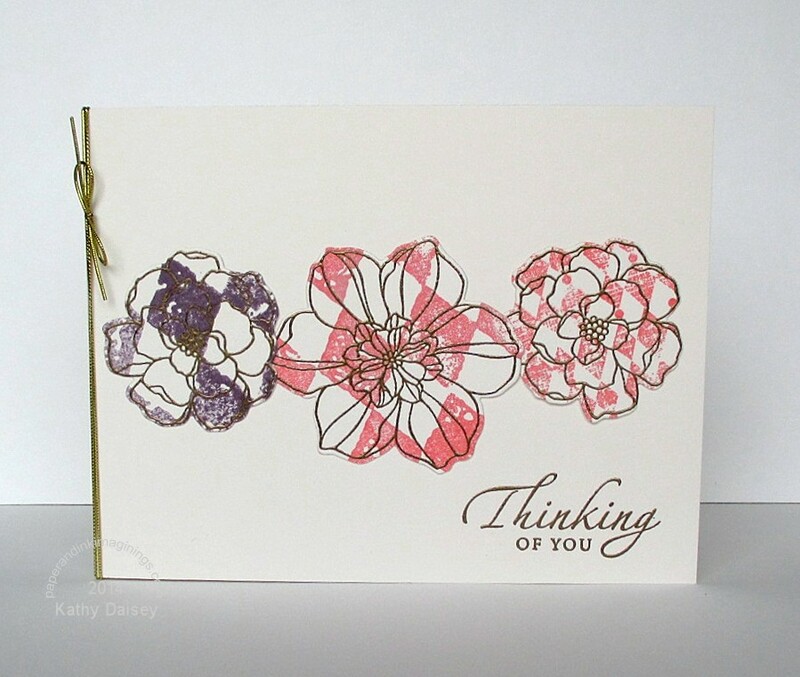 Categories: card, thinking of you | Tags: card, Papertrey Ink, Runway Inspired Challenge, Stampin' Up! | Permalink. Here is my effort for the latest Runway Inspired Challenge (ric#67). 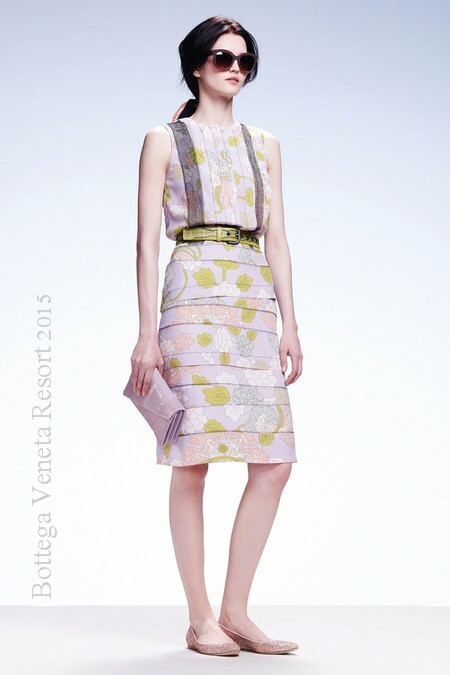 I focused on the almost optical illusion quality of the suit fabric, and the colors of the top. Today is the 13th anniversary of the 9/11 attacks – take a moment to remember those who lost their lives. Supplies: Stamps – Papertrey Ink, Stampin’ Up!, paper – Echo Park, Papertrey Ink White, Stampin’ Up! Perfect Plum, inks – Stampin’ Up! Bermuda Bay, Crushed Curry, Perfect Plum, Pumpkin Pie, VersaFine Onyx Black, gems/dots – Queen&Co, embossing powder – Filigree Fine Art Powder clear, Stampin’ Up! Silver Detail Powder. Categories: card, thinking of you | Tags: card, Echo Park, Papertrey Ink, Queen&Co, Runway Inspired Challenge, Stampin' Up! | Permalink. Here is my take on the latest Runway Inspired Challenge (ric#66). I used the edge/die idea from Papertrey Ink’s Make It Monday #175 . 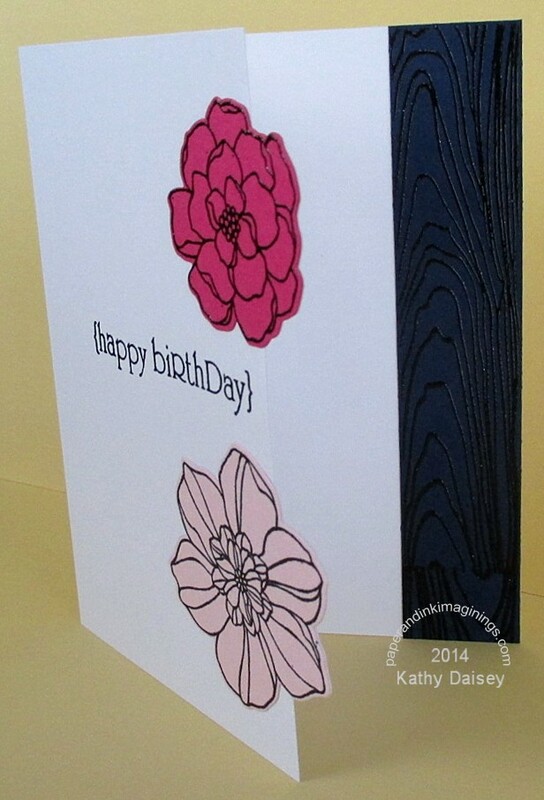 The navy panel was stamped with a woodgrain stamp and embossed, and attached to the inside of the card. All of the embossing is done in navy. 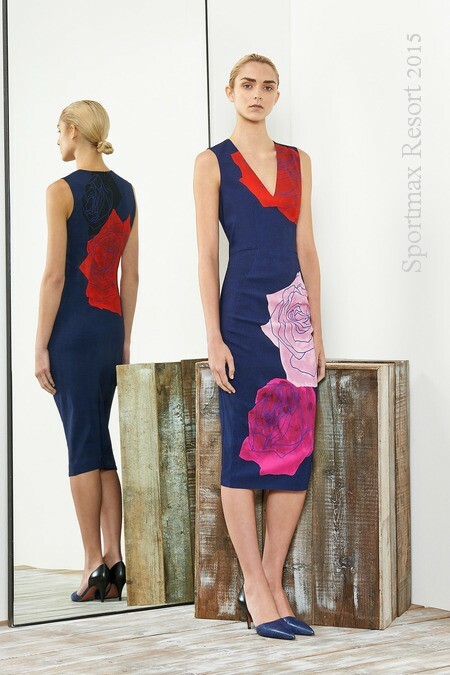 I love this inspiration piece by Sportmax – I could wear bold pink/navy every day. Supplies: Stamps – Papertrey Ink, Stampin’ Up!, paper – Papertrey Ink White, Stampin’ Up! Melon Mambo, Night of Navy, Pink Pirouette, ink – VersaFine Onyx Black, dies – Stampin’ Up!, embossing powder – Stampin’ Up! Navy (retired). 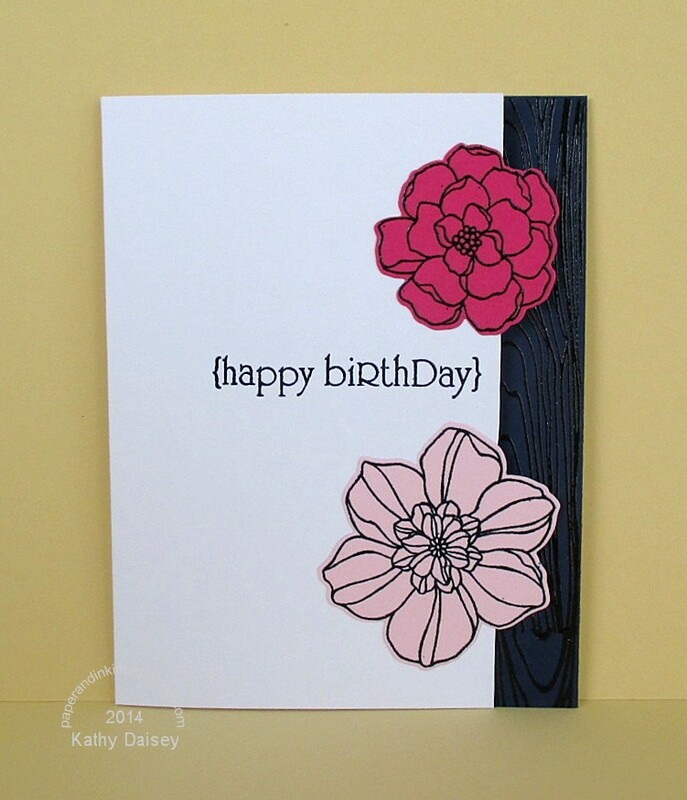 Categories: birthday, card | Tags: Papertrey Ink, Runway Inspired Challenge, Stampin' Up! | Permalink. Here is my interpretation of the latest Runway Inspired Challenge (ric#64). I made a very simple, very muted sympathy card. 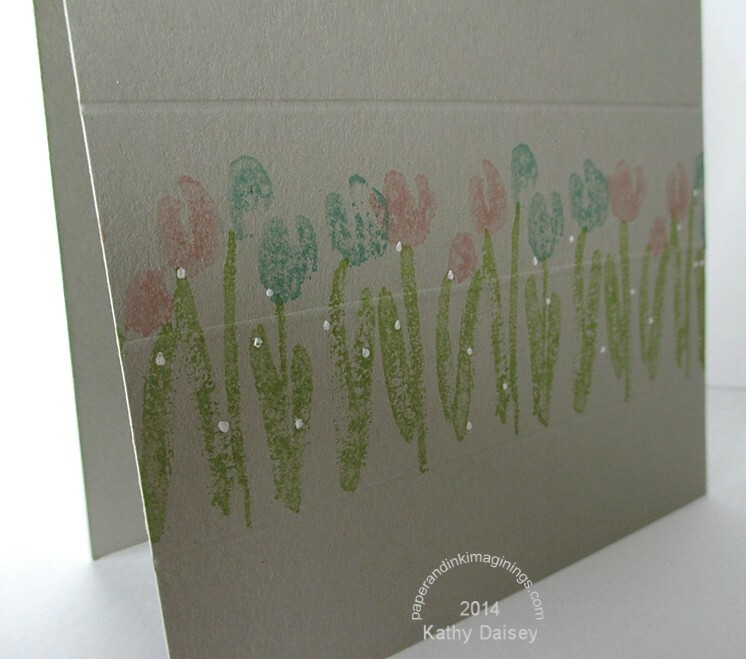 The flowers and stems were stamped off once before being stamping onto the Sahara Sand cardstock. 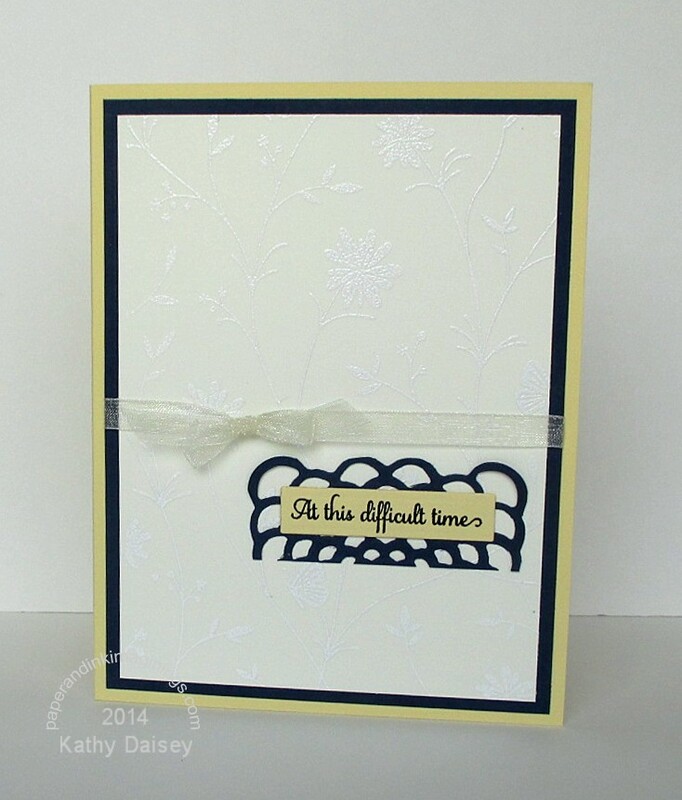 I added a sentiment embossed in white, and scattered white dots with a Signo Gel Pen. I also scored the paper horizontally, twice from the front, once from the back. Supplies: Stamps – Papertrey Ink, Stampin’ Up!, paper – Stampin’ Up! Sahara Sand, inks – Papertrey Ink Fresh Snow, Stampin’ Up! Blushing Bride, Certainly Celery (retired), Pool Party, Signo Gel Pen, embossing powder – Filigree Fine Art Powder white, gold organdy ribbon – Stampin’ Up! 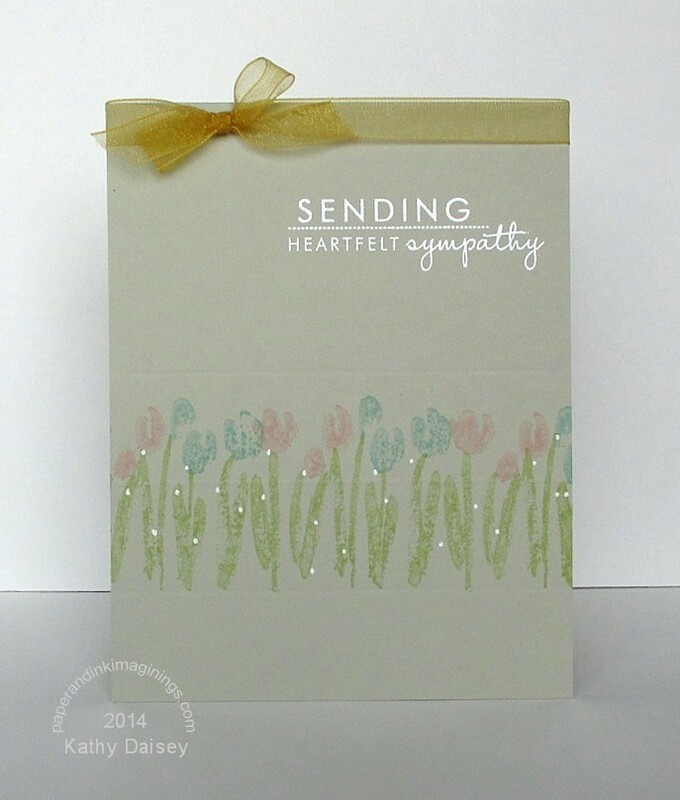 Categories: card, sympathy | Tags: card, Papertrey Ink, Runway Inspired Challenge, Stampin' Up! | Permalink.